Jean Conan Doyle (“Billy”; December 21, 1912 –November 18, 1997) was the second daughter of Sir Arthur Conan Doyle. 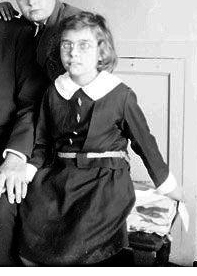 She was a spirited child who was described as a tomboy by Houdini. Her childhood nickname was “Billy,” and letters to her father would be signed “Your loving son.” She then went to her Aunt Ida’s school, Granville House in Eastbourne, where she took after her mother in developing a love of nature. As a schoolgirl she was a classmate and friend of Joan Boniface Winnifrith, who would become film and television actress Anna Lee. Jean went on to serve for thirty years in the Women’s Auxiliary Air Force, where she worked in intelligence during World War II. Commissioned a section officer, she was promoted to temporary flight officer in 1942 and to temporary squadron officer in 1944. On April 1, 1963, she was promoted to air commandant, the highest rank in the Women’s Royal Air Force. On April 29 of the same year, she was appointed an honorary Aide-de-Camp to Queen Elizabeth II, serving until 1966. On 1 June 1963, she was elevated to Dame Commander of the Order of the British Empire (DBE, Military Division), and was known as Dame Jean Conan Doyle. She gained the additional style “Lady Bromet” upon marrying Air Vice-Marshal Sir Geoffrey Rhodes Bromet (1891–1983).